Last time we met, I wasn’t a prime candidate for spontaneity: my weeks filled with work and class, my weekends with reading and schoolwork. That steady drumbeat of work and school has continued relentlessly since then, but when I got wind of a flash sale on airfare about a month ago, the prospect of a commitment-free long weekend in a new-to-me city won out over the prospect of yet another Saturday and Sunday curled up with my estate planning textbook. I paid $154.20 for a round-trip ticket to Austin with a departure date less than two weeks later, and woke up the next morning with a spontaneity hangover. If you’re familiar with Brené Brown’s work, you’ve probably heard of the concept of a vulnerability hangover: that deep feeling of shame and regret, which arrives in a wave after you’ve shared something that makes you feel emotionally exposed. And if you’re not familiar with her work, well, I’m sure you know what that feels like. I felt something similar after purchasing my plane ticket. The blowback didn’t come from vulnerability, however, but from indulging a spontaneous and carefree urge to treat myself—something I don’t do often enough. Regretful questions flooded in: would I be neglecting my study group that weekend? Shouldn’t I wait to travel until work quieted down? But obligations are ever-present, in one form or another, like a real-life game of whack-a-mole: you fend one off, only to find another crop up in its place. As a responsible, duty-bound person, I’m highly skilled at finding easy excuses for staying put. It is my life’s work to fight that inclination and commit myself to new adventures instead. Something else I’m highly skilled at? Overplanning my vacations. My 9-to-5 deskbound brethren can probably relate: overplanning always starts as an innocent desire to make the most of one’s limited free time. For awhile, overstuffing the itineraries of my various weekend trips gave me a sense of accomplishment, and a heady adrenaline rush: look how many amazing experiences I can pack into 48 hours! (See: Michigan, Kentucky, Seattle.) It felt like a pleasantly subversive way of reclaiming my paltry supply of vacation days. Over time, though, that approach has become less exhilarating and more exhausting, and I’ve begun to prefer a balance between structure and spontaneity. It’s nice to leave myself enough room to be surprised by a place, and to be gentle with myself when my mood or energy level doesn’t correspond with the next agenda item. And when I inevitably miss out on something, it’s a fun excuse to come back again soon. Our reasons to return to Austin? Mount Bonnell, Texas hill country, and Jester King brewery. (And photography! I was too busy relaxing to shoot more than one roll of film.) Despite missing out on all of the above, four days was plenty of time to experience much of what Austin has to offer. We spent ample time outside, hiking to Sculpture Falls and splashing around in the river, and beating the heat at Barton Springs Pool. At dusk, we paddled Lady Bird Lake in a double kayak, and idled beneath Congress Avenue Bridge to watch the bats emerge en masse. We balanced our active time with plenty of fuel, of course, mostly in the form of barbecue and breakfast tacos. And we spent plenty of time exploring Austin’s neighborhoods on foot, chatting with its ridiculously friendly residents along the way. 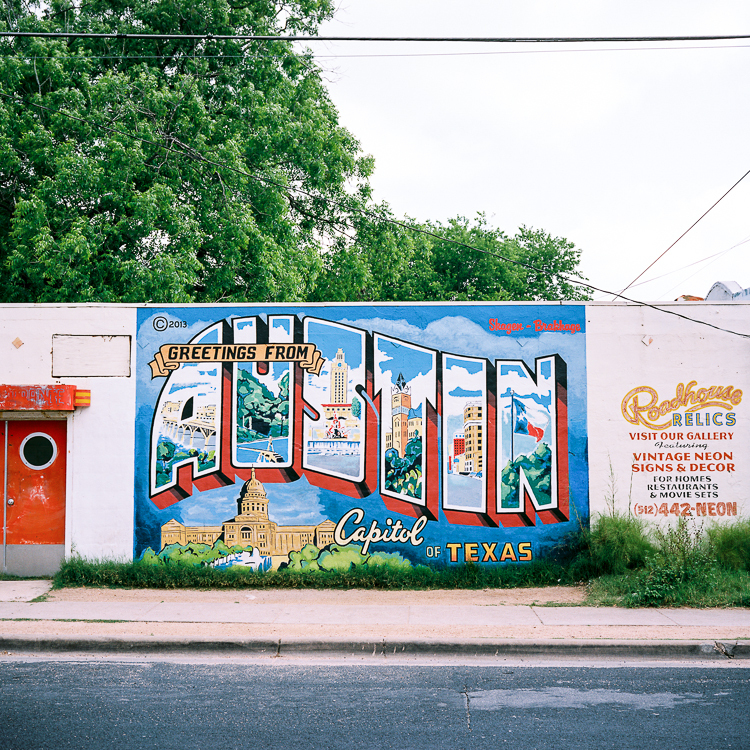 We stayed in quirky South Austin (with the world’s nicest AirBnB host), window-shopped on South Congress, and ate and drank in colorful East Austin. And we hung out downtown—exploring the Texas State Capitol, hydrating at the unique bars on Rainey Street, and catching a movie at the Alamo Drafthouse. Next chance you get? You should say yes to Texas, too.